A series of solar energetic particle events observed in July 1996 with the COSTEP-EPHIN experiment onboard the SOHO spacecraft in the Lagrangian point L1 of the Sun-Earth system. 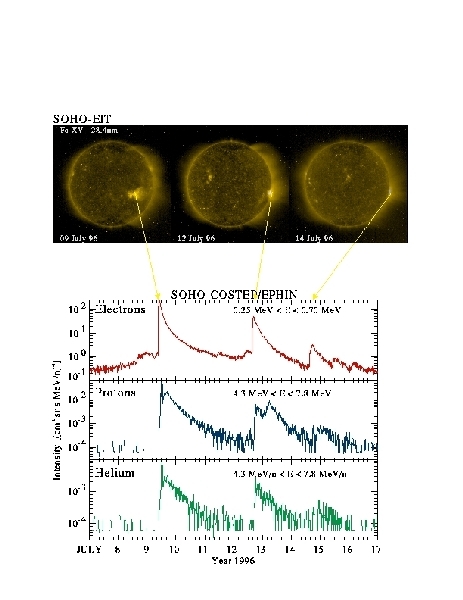 The upper panel shows images of the Sun taken on July 9, 12, 14 with the SOHO-EIT in Fe XV (28.4 nm). 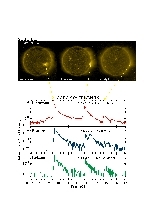 The bottom panel shows intensities of 0.25-0.7 MeV electron, 4.3-7.8 MeV proton and 4.3-7.8 MeV/n helium nuclei measured with the COSTEP-EPHIN. The intensity increases of the energetic particles at SOHO were caused by flares and coronal mass ejections in an active region in the Sun's western hemisphere.